PELLY, Sask.—It’s not every day you have someone who has done the same job in the same church for 50 years. In August 2017 Lewis and Vivian Anfinson celebrated 50 years as Pelly’s deacon couple. You do not hear too often a person who does the same position in a church for 50 years, never mind a couple who does the same position together in the same church for 50 years. On Sunday, August 27, 2017, we had our regular Sunday service. At the end Pastor Frankie Kim made an announcement of a special service. Lewis Anfinson, easy-going as he is, did not seem to have concern. Vivian did not know what was going on. I could see her whisper to Lewis, who shook his head no. Pastor Frankie Kim led a short service to thank Lewis and Vivian for their 50 years of service as our deacon couple. People joined us from Kamsack, Norquay, Hyas, and Benito. There was an open microphone. People spoke how Lewis and Vivian were an example for them in one way or another. They admired Lewis and Vivian, and spoke of what a great couple they are. They have given of themselves to the church and the community. Both Lewis and Vivian volunteered wherever they were needed. They were there to help out and volunteered at numerous places over the years. The Anfinsons were presented with a plaque. People took pictures. Vivian said for the first time she was speechless. She was too moved and touched, and thanked everyone for coming and the lovely words and the plaque. Then Lewis spoke and thanked everyone for coming and for everything. After we all went downstairs for a surprise lunch. It was my honour to interview Lewis and Vivian for an article. 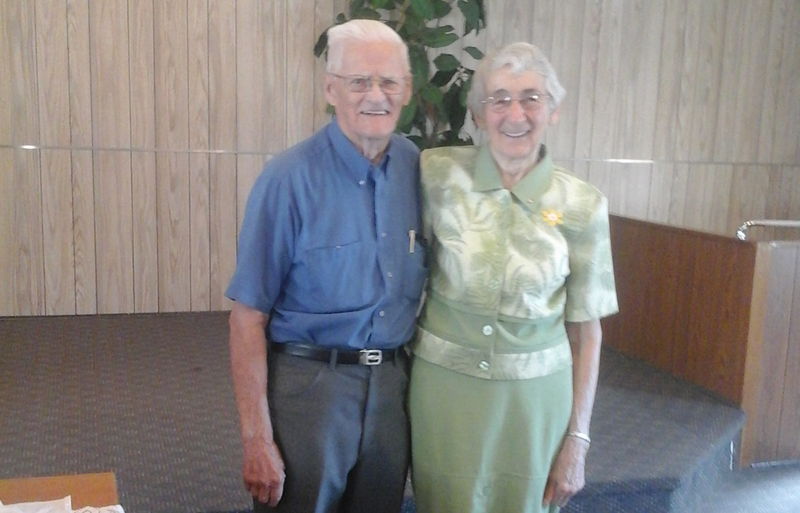 They were both very humble about their position as a deacon couple, and are doing it as to the Lord. Vivian said it is a privilege to serve the Lord and the church in this way. Lewis said he will do whatever work the Lord leads him to do. Lewis and Vivian were married in 1951. When they and their family started attending what became Pelly Fellowship Chapel, people would gather in each others’ homes for church, a different home each week. Then they rented a house in Pelly and called the church Pelly Fellowship Chapel. A missionary Benny Eidse, from the Western Gospel Mission, led the church. From that, the church grew to what it is today. Vivian was a Christian when she and Lewis started attending church. Lewis became a Christian back in the days when they were still meeting in each others’ homes. In August 1967 the congregation of Pelly Fellowship Chapel voted in Lewis and Vivian as their deacon couple; and they are doing such a great job we will not let them step down.